Passed away peacefully at RAAFA Tuart Lodge, Merriwa on 20.3.19. Aged 93 years. 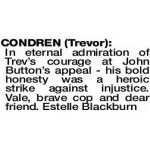 Loved husband of Vivienne (dec). Loving father and father-in-law of Dianne and Greg, Stephen and Rhonda, Philip and Cath. Grandfather of Brendan, Ryan, Aaron, Wade, Chanelle, Jessica, Samantha, Maddison and Olivia. Great-Grandfather of 7. Reunited with Vivienne. 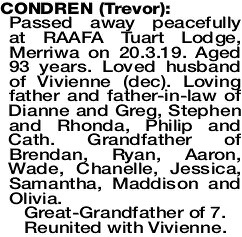 The Funeral Service for Mr Trevor Condren of Merriwa will take place in our Chapel, 502 Wanneroo Road (cnr Victoria Rd) Westminster commencing at 10:00am FRIDAY (29.03.2019).